Litotes, the Greek word for "simple," is a member of the figurative language family tree. Since it's not an English word, don't be fooled by the fact that it ends in S. Litotes is a singular noun. Litotes examples embrace colorful sentiments to express an otherwise bland statement. A litotes is a roundabout way of saying something, using the opposite of your intended meaning to illustrate what you're trying to say. The negative of one thing is used to express the positive of its opposite. That seems anything but simple, right? Fear not. As soon as you see a litotes in action, it'll all make sense. Let's open the door to litotes territory. While a litotes is a member of the figurative language family tree, its closest relative is irony. With irony, you expect one outcome and receive another. In truth, a litotes will use irony to emphasize an idea without minimizing its importance. For example, a friend might expect her roommate to talk about someone who's obviously wealthy by saying, "He's filthy rich." However, when she comes out and says, "Well, he's not exactly a pauper," it's a little unexpected. Again, literary devices are smart ways to spice up our literary lives. By saying someone is not something, you imply that they are the opposite. If you say Jeremy is "not tall," you're implying that he's short. "They're crazy to stay together" is straightforward. But consider this subtler example: "They don't seem like the happiest couple in the world." It's a gentler, seemingly ironic, way to say something without having to "come right out with it." Her cooking isn't terrible, exactly. Ireland is no ordinary country. 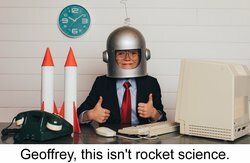 Geoffrey, this isn't rocket science. Your commentary on their relationship was less than smart. In truth, I can't argue with any of your assertions. All in all, she wasn't a bad dancer. He's not unlike his older brother. They spent seven months apart; that's no small amount of time. They don't exactly have an ordinary relationship. She's not the sharpest knife in the box. Your kitchen isn't disorderly, per se. You won't be sorry you bought a kitchen organizer. His statements are not without truth. Large crowds of people are not my cup of tea. From time to time, you can take the roundabout road to deliver a line to your readers. It's okay to make them think. Just take a moment to re-read your litotes and make sure your meaning is clear. A litotes can be tricky. In everyday life, especially with issues pertaining to clarity, it's not always recommended. However, when you're looking to spice up your prose and make readers pause to think, throw them an ironic litotes or two. They'll appreciate the stretching of their mental muscles. Ready to explore a few more literary devices? Consider a little symbolism in your next piece. Or, perhaps you'll want to hit your readers over the head with a blatant epiphany. Check out some of these examples of epiphany from a couple of literary giants. "Litotes Examples." YourDictionary, n.d. Web. 23 April 2019. <https://examples.yourdictionary.com/litotes-examples.html>. Litotes, the Greek word for "simple," is a member of the figurative language family tree. Since it's not an English word, don't be fooled by the fact that it ends in S. Litotes is a singular noun.Litotes examples embrace colorful sentiments to express an otherwise bland statement. A litotes is a roundabout way of saying something, using the opposite of your intended meaning to illustrate what you're trying to say. The negative of one thing is used to express the positive of its opposite.That seems anything but simple, right? Fear not. As soon as you see a litotes in action, it'll all make sense. Let's open the door to litotes territory.